Double J Ranch is a trail rider's dream. Just off the 210 Freeway, we are located in a quiet neighborhood, in Lake View Terrace, California, with immediate access to the trails. No street crossings necessary! 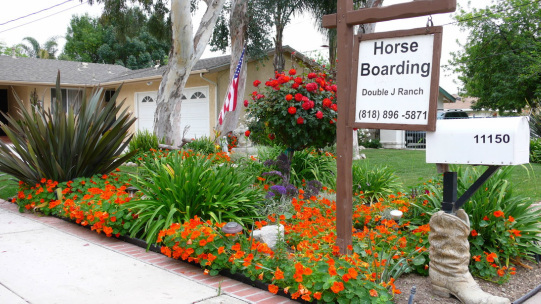 This safe, quiet ranch has it all: Board includes feed, cleaning, and full use of the services offered at the facility. For safety and security purposes, our property is completely fenced, and owner and private residents complete routine and daily checks on all horses and lock perimeter gates at night. Horse trails in this area are plentiful and offer the rider a variety of choices ranging from easy, comfortable trails, to more challenging ones. Call us, and come hit the trails!